A new academic study helps explain the enduring political popularity of expensive transportation boondoggles like Birmingham’s $4.7 billion Northern Beltline and Kentucky’s $2.6 billion Ohio River Bridges. According to research published in the journal Public Administration Review, states with higher levels of public corruption spend more money on highways and construction. The study found highway and construction projects and police programs provide the most opportunities for lawmakers to enrich themselves, according to Governing Magazine, and are positively correlated with state levels of corruption. Meanwhile, highly corrupt states also spend relatively less on health, education, and welfare — categories that were less susceptible to graft and bribery, the report found. Public corruption for each state was ranked based on 25,000 convictions between 1976 and 2008. Overall, the authors found, the 10 most corrupt states spend $1,300 more per person annually than the average state. This is funny. Obviously the numbers are old, because saying Michigan is in the second least corrupt states categories have never heard of Metro Detroit. And that is both sides of the political aisle. Interesting that Public Administration Review equates “corruption” with the successful prosecution of corruption. And that they believe that bribery is easier in construction trades than social services or healthcare. That’s not the experience in corrupt New York , where our biggest scandals using state funds have been around Medicaid clinics (Espada), affordable housing (Vito Lopez) and social services (Rapfogel.) These may or may not be the most corrupt states but they have no real evidence to support either of their main assumptions. Corrupt governments spend more on _everything_ and take more of everything. Do you really think that the Ashland BRT project isn’t going to be loaded with cronies? Of course it is. Just like any other project. The more centrally planned things are, the more they are in the hands of government, the more opportunity there is for corruption. Transit has long been an area the corrupt have exploited to their own benefit. However, transit doesn’t sell to people as easily as roads. Projects need to first be sold to the public. Roads have sold easier for decades. Politicians can take a lot more from a transit project over the long haul, they just need to be able to sell them to the people. Right. Governing only measures incompetent corruption. We have some of that, but also much more skilled thieves in the legislature. The most corrupt thing of all is all the retroactive pension increases with fraudulent descriptions of what they will cost. Someone should go to jail for that, but no one will. How else would we know there is corruption? How do you place projects on the “who’s planning it” spectrum? What’re example of a “very centrally planned” project and a “not at all centrally planned” project (and who’s planning them)? It’s about what sells better. Politicians and their cronies will use _any_ project to transfer wealth from the taxpaying people to themselves. Roads often sell easier than transit and other things*. Military sells easily too as do things for the children, the environment, or the poor. The very idea that corruption and roads go together is yet another attempt to manipulate the reader. Corruption exists in the proportion to which people will tolerate government and its cost. *Also it’s very easy to make substandard roads which need work again a short time later. Makes sense. This is why Illinois has terrible roads despite constant construction projects. Roads are deliberately built poorly so the connected crony contractors can redo it again in a couple of years. The same cronyism extends to transit projects as well. Does anyone honestly believe the new Wilson Red Line station and track legitimately costs 1/4 BILLION DOLLARS? And that’s not even the final cost. The special FBI investigator in charge of government corruption said the metro detroit corruption made metro New Orleans corruption look like amateurism. It is not just the city but the neighboring counties and at the state level. This wasn’t really exposed until after the study years in this study. It was suspected, but not exposed. Just what I was thinking about our roads here in the Mississippi of the North. And in light of this article, maybe it’s no coincidence that we are near the bottom on every measure of spending for people with disabilities and other social services. Actually, the fifth-most-corrupt. 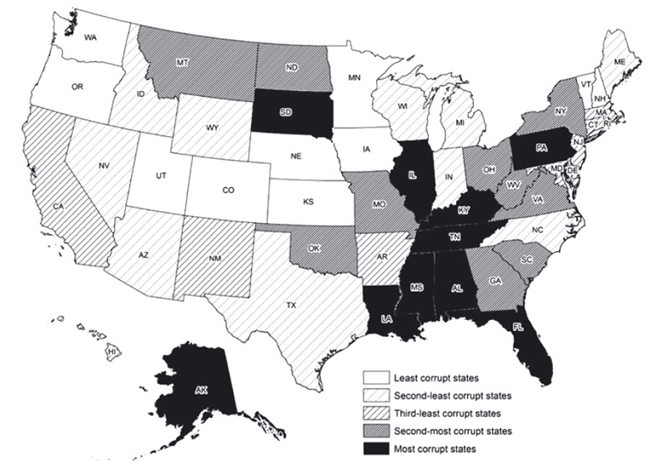 Mississippi, Louisiana, Tennessee and Illinois were all ranked as more corrupt.